We have a great Miami home coming on the market. 14456 SW 161 Place, Miami, FL 33196 will be listed for sale in the next few days. Of course, we wanted to give our loyal readers a heads up about this great home. This home is in the SW area of Miami, easily reached from the Florida Turnpike, off the Zoo Miami exit. It was built in 2000, has 4 bedrooms, 2 baths, a 1-car garage, screened terrace and in-ground swimming pool. You will fall in love with the open floorplan, wood floors and remodeled kitchen with it’s extra tall wood cabinets, granite counters, recessed lighting, undermount stainless steel sink and spacious granite island. 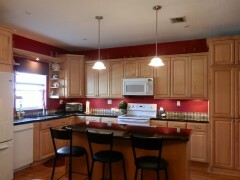 This entry was posted on Thursday, February 14th, 2013 at 3:11 pm	and is filed under Featured Homes. You can follow any responses to this entry through the RSS 2.0 feed. Both comments and pings are currently closed.